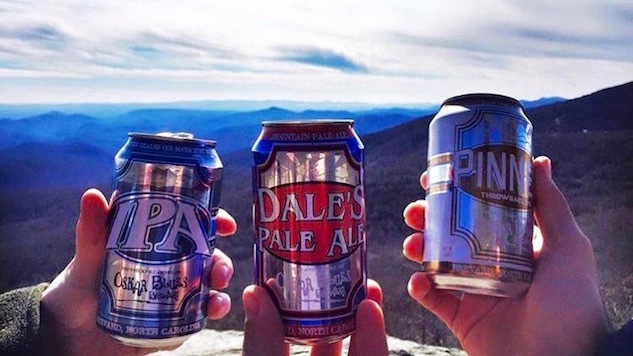 Dale’s Pale Ale is more than just the flagship for Oskar Blues; the beer has evolved to represent innovation within the craft beer world, thanks to breaking the “aluminum barrier.” At the same time, Dale’s reflects Oskar Blues’ willingness to upset the status quo that goes beyond the single serving can. In recent years, Oskar Blues has helped unleash the crowler to the world. As for beers, they continue to focus on a relatively hop-forward profile, releasing both Oskar Blues IPA and Pinner Session IPA over the past year. With the craft brew environment in the middle of a massive evolution, the brewery’s Chad Melis offers some insights on hops and staying inventive as the industry morphs. Paste: Are you surprised the industry has gone so hop-heavy as a whole? Melis: It’s been surprising to see how IPA has had almost limitless growth over the last 10 years. There’s a lot of creative breweries doing a lot of really cool things, creating options and the drinkers are becoming more educated and more demanding, getting used to those options. I think we’ll continue to see more and more diversified needs and requests from the beer drinker, although IPA has been on a tear. Paste: In newer IPAs I see the “it hops” and single-hops leading the market. What do you think of that movement? Melis: We’ve definitely been part of that. We’ve experimented with a ton of hops. The Oskar Blues IPA is all southern hemisphere hops. Some of those relationships we’ve been working on for three years. I believe that was the first production beer in America to include Enigma and that mix, so it’s certainly something we’ve been engaged in. It’s not just hops, we’ve been full-bore on where our ingredients come from: the quality, visiting the facilities and their crops, and being part of the process. Tim Matthews has traveled the world digging into the raw ingredients that go into our beers. “Grow local” is always a buzzword on how to sell beer, but as that grows and as the beer drinker is more educated, quality is going to be a long lasting key ingredient to success and longevity. Raw ingredients are a huge focus and we are literally “hands-on” with the raw ingredients we put into our beers. Paste: I see a lot of changing ingredients in beer styles instead of, say, “Here’s our Dale’s Pale Ale” you get a single hop version. Do you think the constant changing of hop varieties or yeast strains is something that will grow going forward? Melis: I think so. To find creative ways to push the envelope, that’s at the core of craft. With all this growth, there are so many different options. Paste: Is it harder to be creative among 4,000 total breweries? Melis: It’s part of the maturation process. The game continues to elevate and there are rock stars in the craft beer scene that keep taking it up a notch. The level of execution and quality is rising and that’s what you want. It’s healthy competition and progression. That’s what gets us out of bed and to the brewery every day. It’s fun. Paste: What are some challenges in sourcing materials from Australia? You said it took three to four years to establish those relationships. Melis: Figuring out how to collaborate and, within that relationship, how to communicate and understand both sides of the fence: what the brewer is looking for in aroma and taste and, on the other side, the brewer understanding the challenges of the hop farmer and trusting each other enough to be progressive and try different things. It’s not free for the hop farmer. They don’t just plant something and something magical growls, it takes time—years—and there’s risk for that farmer. Then it’s a 16-hour flight. There are logistical challenges. Those are the lengths we’re going to seek out those raw ingredients that set us apart and push the boundaries. It’s a worldwide search. Paste: Is it an expectation that you’ll be “copied” when you do something new? For example, did you expect Enigma to turn up elsewhere once people tasted Oskar Blues IPA? Melis: We’ve never been out there to hoard things or be exclusive. For example, we’ve collaborated and brought people into the can game. Look at what we’re doing with the crowler. We’re selling machines and cans and labels, making them available to everybody. It’s about being creative and challenging ourselves and the beer drinker. We’ve never turned anybody down for a beer recipe and we’re always willing to share ingredients as long as we have enough to make what we need. If everybody hops on the bandwagon and starts to use Enigma, well that’s where the search starts. There’s not enough of a lot of these varieties. Part of the concept of Deviant going seasonal was when those fresh hops are available that beer is bomber, but if you’re on month 10 and trying to make it without the fresh hops—screw it. Let’s make Deviant the way we meant it to be, so we make it for three months. All of it plays into that search for raw ingredients and quality. Paste: More influence than copy. Whether it’s packaging, what we did with Dale’s Pale Ale in 1999, or raw ingredients… What other people are doing, whether using things found elsewhere or not, it’s the challenge within ourselves that drives what we do. Paste: Awareness seems to have turned a real corner with cans. Were you with the company in those early days of spreading the word? Melis: It will be nine years in May, and I’ve lived in Lyons for 13 years. Just to bring a can into a bar, at the price point we were at, we were literally thrown out of bars. It was winning one at a time, even to get it into the liquor store. You still go some places, and stores will have Dale’s Pale Ale in the domestic cooler because it’s got cans. The first five to eight years were much more challenging than the last five.